On Wednesday, May 23 (2018), people all across Australia gathered to break the Guinness World Record for the Most people stargazing – multiple venues. The current World Record, set in 2015 by the Australian National University (ANU), is 7,960 people across 37 locations. With tickets purchased – the event was free but the ticket saw you receiving a mini telescope – off we went to Brisbane’s Roma Street Parklands where we were not alone. (Hello ‘Captain Obvious’). Approximately 5,000 other lunatics were there, including my friends Denise and Anne, and we delighted in being part of the attempt to break this world record. All we had to do was get in, collect our telescopes, and be ready. But back to our world record attempt. All across Australia, people gathered at local parks, at their local schools, on nearby beaches, at local observatories and lots of other areas to simultaneously gaze skyward. In fact, beyond the large public events in Brisbane, Sydney and Canberra (including a special event held at Parliament House), there were 14 universities involved across more than 20 campuses, more than 100 primary and high schools, eight observatories, 43 Girl Guide units and 35 Scout groups. People also gathered at Star Parties in many remote locations including Birdsville, Broome, Port Hedland, Karratha, Kalgoorlie, Uluru, Alice Springs, Charleville, and Broken Hill. The scene was well and truly set to smash that record. With a one hour window between 8:00 pm and 9:00 pm to work with – needed to maximise clear skies across the country – the official stargazing time was set for 8:40 pm. At 7:15 pm we were still sitting outside waiting for the optimum moment to join the line and enter the venue. We’d been there since 5:00 pm but the gates didn’t open until 6:20 pm. In retrospect, we should have left, found somewhere to have a meal, enjoyed said meal, and returned, AND we still wouldn’t have missed anything. But hindsight is always 20/20, and we continued to sit, enjoying a packet of dark chocolate Tim Tams between us, while the line of lunatics continued to flow past us at a steady rate. We finally made our move just before 8:00 pm. I think we were light-headed due to the lack of food as well as the sugar rush from the biscuits, but sitting out the waiting period turned out to be a good idea. Getting something else to eat was not a priority. For almost three hours we were comfortable, cool, but not cold, nor as cold as we might have been sitting on the grass, and as we entered the Celebration Lawn of the Parklands, we promptly found an ideal area to sit – on the concrete steps boarding the ramp leading down to the lawn. Perfect. We had a beautiful first quarter Moon to look at and, with the Moon at 65% visibility and not a cloud in sight, we sat and waited for the countdown to begin. It was very exciting. 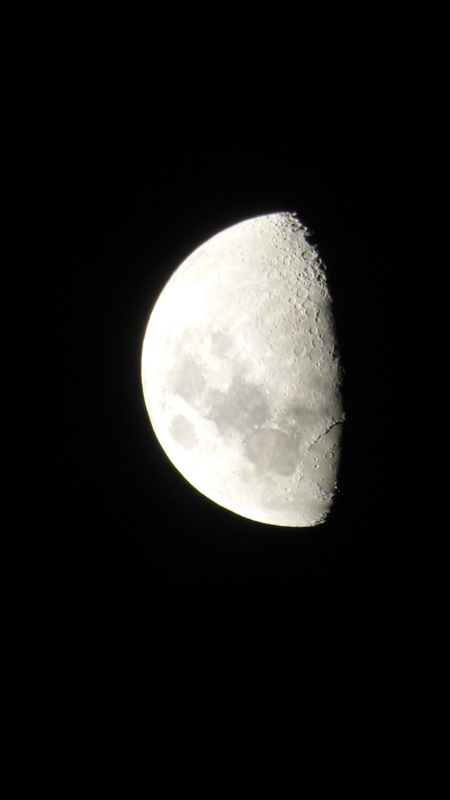 The time finally arrived, and with telescopes ready, for 10 minutes we locked our gaze on the Moon. We were told to change hands, told to swap eyes – though I thought “I quite like the ones I have thank you very much!”. But as our host continued to tell us how much longer to go, arms and necks began to ache. “Are you alright over there Clare?” Denise asked. “Yep” I replied, and we all laughed and continued to gaze skyward. But our little giggles were rather insignificant compared to that of the entire crowd as our countdown continued towards the end of that 10-minute gazing requirement. I was surprised, yet delighted, at the laughter and cheers as well as the whistles and whoops this collective effort generated. Exact numbers are still to be confirmed, however, it is known that over 40,000 people simultaneously gazed at the Moon for 10 minutes across 285 different locations. 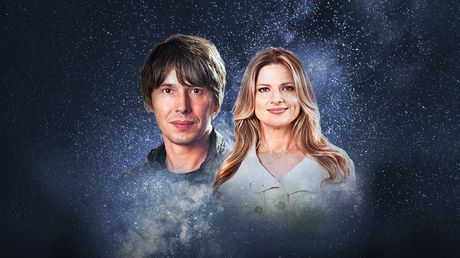 Stargazing Live has seen the audience help identify two new exploding stars, and in the process gather enough data to estimate the age of the universe. Wednesday night saw the discovery of a type Ia supernova 1.1 billion light-years away, and further observations on Thursday night suggested a second type Ia blast slightly closer, some 945 million light years away. Featured image courtesy of the ABC Stargazing Live Facebook page. What fun and how fabulous for you to be part of this! Thank you Nancy. I was thrilled. So cool Mum!! How great to be a part of such an amazing event! I’m so glad we did, it was a hoot, and I’d do it again if they ever try to break this new record.